More women in Saudi Arabia are gaming on the go than men, according to a new study on mobile gaming habits in the Middle East. 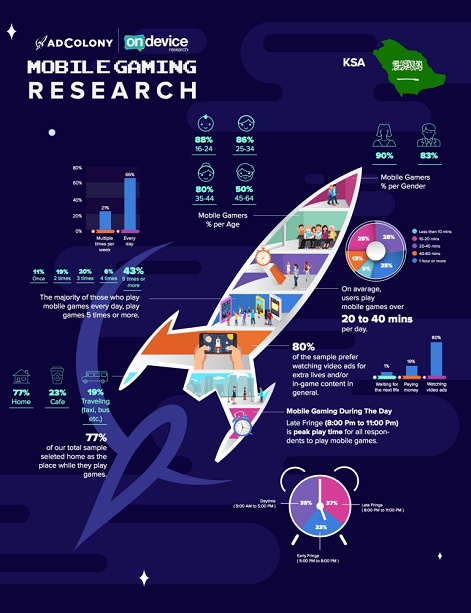 As part of their ongoing “Under the Microscope” series, mobile ads firm AdColony and research group On Device delved into the makeup and player habits of Egypt, Saudi Arabia and the United Arab Emirates. Saudi Arabia stood as the gender outlier when it came to which played mobile games more often. 90 per cent of Saudi women called themselves a mobile gamer out of those surveyed, compared to 83 per cent of men. Contrast that with the other two nations surveyed. 93 per cent of Egyptian men are mobile gamers to 89 per cent of women; in the United Arab Emirates, it’s 87 per cent men to 84 per cent women. Egypt had the highest saturation of Gen X-ers and post-millennial mobile gamers. 92 per cent of centennials - post-millennials, born roughly between 1998 and 2008 - identified themselves as mobile gamers. Across the board, the majority of respondents across all age grounds were identifying as mobile gamers. The lowest figure of 50 per cent was registered by Saudis over 45. The full report is available at the Adcolony site here.